No longer are self configuring secure wireless home networks the stuff of dreams and imagination. The average residential user just can’t cope with the hoops needed to configure a wireless network and secure it. Windows XP’s Wireless Network Setup Wizard and Windows Connect Now, coupled with some of the latest network as well as consumer electronics gear, provide the residential user with a new and bulletproof way to setup a wireless network from scratch. But you have to have the “right stuff” from the right vendor. 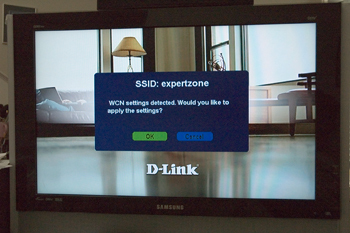 D-Link has done it up right. Check out their DI-624S ‘wireless storage router’. This router can be configured with a USB Flash Drive/thumb drive/memory key that was used with the XP Wireless Network Setup Wizard. Even better, when you’re finished with setup, the two USB ports on the router itself provide shared Network Attached Storage for USB hard drives and Flash drives for any computer on the network. Even more exciting is the extension of the Windows Connect Now technology to consumer electronics devices such as wireless streaming media players. Check out D-Link’s latest MediaLounge (DMS-320RD). Here’s what happened after I plugged a USB Flash Drive with my WCN network settings into the WCN USB port on the back of this device. I’d configured the network with strong WPA-PSK security using a 63 character random passphrase. After OK’ing this with the supplied remote control, the secure wireless connection was made, the device received an IP via DHCP from the router and I was off and running.